Ethiopians celebrated the country’s 10th National Flag Day on Monday (16th October), under the theme: “Inspired by a vision, we are determined to intensify our triumphs”. In his message, President Mulatu Teshome said the flag symbolizes the Nations, Nationalities and Peoples of Ethiopia; their unity and their quest for national pride, freedom and sovereignty. The president paid tribute to the courageous sons and daughters of Ethiopia who had sacrificed their lives for their country. He urged the young in particular, to be inspired by their forefathers sense of patriotism, by participating in efforts to stamp out extreme poverty, corruption and the absence of good governance. The President said the flag serves as a symbol of the victorious struggle against external invasions and of democratic unity in diversity. The 10th National Flag Day was celebrated at a time when the country is achieving impressive results during the second Growth and Transformation Plan period, by undertaking many mega projects, and he urged the public at large to commit themselves to the full realization of the nation`s Renaissance efforts. 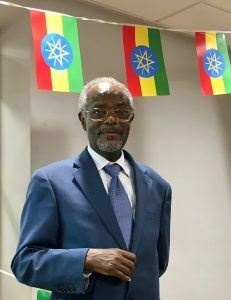 Ambassador Hailemichael, underlined the theme of Flag Day by taking stock of the remarkable achievements the country has so far achieved and by urging embassy staff to redouble their efforts to contribute to the realization of Ethiopia’s vision. If we continue to build sustainable peace and democratic nationalism and end poverty in its all forms, our flag will be a symbol of democracy and progress, and Ethiopia’s star will shine ever brighter.